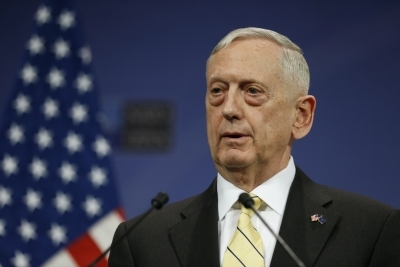 Seoul, Oct 27 (IANS) Visiting US Defence Secretary James Mattis on Friday said that the American government does not want a war with North Korea, but rather initiate a process to achieve a complete denuclearisation of the Korean peninsula. Mattis made the remarks on the first day of his trip to South Korea, during his visit to a border guard post and the Joint Security Area, which is part of the Demilitarized Zone (DMZ) that divides the two Koreas. “As Secretary of State (Rex) Tillerson has made clear, our goal is not war but rather the complete, verifiable and irreversible denuclearization of the Korean Peninsula,” the Pentagon chief said at the truce village of Panmunjom inside the DMZ. He stressed his unprecedented DMZ visit highlights the “stark difference” between the two Koreas. North Korea is ridden with an “oppressive regime” that shackles its people, while the South boasts a vibrant, thriving democracy and free society, he pointed out. In response to Mattis, South Korean Defence Minister Song Young-moo emphasised that North Korea’s nuke and ballistic missiles are “weapons that can’t be used”. “If it does, it will face retaliation by the strong combined force of South Korea and the US,” he said. The minister said he and the secretary are here together to confirm the ironclad alliance “without a single inch of error”. He called on Pyongyang to return to inter-Korean dialogue as early as possible. Song said Panmunjom was once a venue for talks between the two Koreas and armistice negotiations that effectively ended the 1950-53 Korean War. “But now, all dialogue is in a state of being severed,” he added. Earlier on Friday, Mattis visited two US military installations, Osan airbase and the Yongson garrison in Seoul. The secretary had come to South Korea from Thailand, where he attended the funeral of late King Bhumibol Adulyadej on Thursday. Mattis’ trip to the region comes ahead of US President Donald Trump’s visit to Asia next week. Trump will most likely forgo a visit to the heavily fortified border between North and South Korea, a senior White House official said earlier this week, CNN reported. Citing scheduling conflicts in an already jammed itinerary, the official did not rule out entirely a visit to the DMZ.